Our Samburu team were given an unusual challenge recently when they went in search of a camera-shy collared bull elephant named Tony in Northern Kenya. For the past two years, we’ve been trying to get new photos of Tony for our elephant ID database, but he’s evaded our efforts every time. Our long term monitoring research requires individual photographs of each elephant that enters Samburu National Reserve. Individual elephants can be identified by differences in their tusks and the unique patterning of nicks and tears in their ears. To capture these patterns, and keep our database up to date, we need to get good images of both sides of the elephant’s head with the shape of the ear clearly visible. While we have great ID photos of more than 900 elephants, our photos of camera-shy Tony are unsuitably old and grainy. Tony is a bit of a celebrity in the elephant conservation world. A large migrant bull in his 30s, he made history and headlines in 2011 by becoming the first elephant known to use the newly built highway underpass on the main Nanyuki-Meru Road (A2) adjoining the Gare Ndare Forest in Lewa with the Mt Kenya Forest in Northern Kenya. The building of the underpass was an ambitious idea with many initially skeptical about its potential success, yet in less than 24 hours of opening, Tony had passed through, as shown by the tracking device he was wearing. The establishment of this corridor - the brain child of the Kenya Wildlife Service, Kisima Farm, Marania Farm, The Bill Woodley Mt. Kenya Trust, the Ngare Ndare Forest Trust and the Lewa Wildlife Conservancy, was significant as it re-connected two different elephant populations and reduced habitat pressure within Lewa. Since then, Tony has used the corridor on a regular basis but hardly ever visited Samburu National Reserve or the nearby protected areas. Last time he was in here, in November 2016, he and his friend Mlima Surua led our monitoring team on a merry chase into thick bush for more than three hours during another unsuccessful attempt to photograph him. So when our tracking app, powered by Vulcan, showed that Tony had ventured into the reserve last month - no doubt enticed by all the rich vegetation and large number of females visiting the park, we raced to find him. 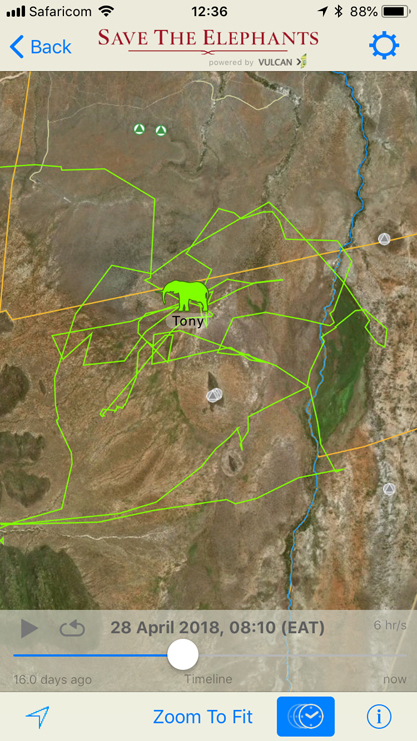 Our tracking app, which displays the GPS locations of collared elephants in near-real time, showed Tony was easily accessible - close to Buffalo Springs airstrip. We naively estimated we would find him within 15 - 20 minutes, snap our pictures for the database and be back at camp in time for lunch. Tony, on the other hand, had other ideas. Two hours after leaving camp, there was still no sign of the bull. Instead, we found ourselves deep in rough terrain and thick bush with our vehicle bogged down by heavy mud in the pouring rain with no internet access and no cellphone coverage. We immediately had flashbacks to the November 2016 expedition. After we dug out our car, we found Tony travelling with a group of females from the Virtues family. He was far from the airstrip, showing just how fast elephants can travel, and heading even deeper into the mud and bush. But before we could get a single photograph, he spotted our vehicle and was off like a rocket with the entire Virtues family in tow, trumpeting loudly. It was impossible to follow Tony and we could only watch as he disappeared with the herd into the distance. It’s amazing how quickly you can lose sight of an animal as large as an elephant and Tony was no exception. All we could do was wave him goodbye, find out way back to the main road and make our way back camp. We were soaked to the skin and muddy but delighted to have made it out of the bush in one piece. Tony’s photographic shoot would just have to wait another day. While we didn’t succeed in this particular mission, it was a good demonstration of how difficult it is to follow elephants even when assisted by the latest in conservation technology. Our elephant recognition database records the changing fortunes of individual elephants, providing us with deep insights into their behaviour, their family structures and their history. Combined with our tracking systems, we now monitor 358 elephants across Africa, enabling us and our partners to respond to events far faster than before. We hope Tony will stick around for a few more days so we can update his file in our database, but we may have to wait until the next time he ventures into the park. We’ll be sure to have our cameras at the ready again!